Heathrow Woods is located in Lake Mary Florida and is a well-kept upscale community within the highly desirable Markham Woods Road corridor. The entrance is gated and guarded and located directly off Markham Woods Road just north of its intersection with Lake Mary Boulevard and directly across from the west side gated entrance and exit to Heathrow proper. It is bordered by Alaqua Lakes to the south and southwest, the Wekiva Conservation Area to the west and Magnolia Plantation to the north. Though developed by the same developers as those who developed Heathrow, Heathrow Woods is a separate and distinct neighborhood with a separate Association and Board of Directors and a look and feel unique to its own. Originally developed in the late 1980s and through to the early 2000s, there are now 185 homes located there. 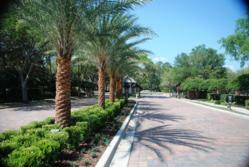 All of the homes are large custom homes built by a variety of custom builders. The homes range from just over 3,500 square feet of living space to more than 7,500 and are situated on lots beginning at one acre. Approximately 10 of the homes are on actually on double or triple lots. Price points generally begin in the $800s and rise to more than $3 million.